In my previous post I showed how themed days and themed trello cards can keep you focused. This post explains how you can structure your trello board for planning and getting things done in business. I will also show how you can quantify your work so you can see how much you need to do, how much you are doing and how much you get done each week. I use Trello as my productivity tool of choice. I have tried a lot of tools and Trello works best for me and it's awesome. If you want to try my productivity approach then you must get Trello. If you haven't used Trello before then go and sign-up for a free Trello account. BTW: I am not affiliated with trello. It's just the best tool there is. I use 4 list for my planning. This Month: Any cards you think should be done this month should be moved from the Inbox to the "This Month" list. You could stop there or keep moving cards into the next lists. This Week: Anything that you need to do this week should be in the "This Week" list. Today: Everything that needs to be done today is in the "Today" list. Best you prepare the Today list the night before. Add them in the sequence you plan to work through the cards. The top card is the next card you should work on. The following shows how the cards flow from the Inbox through the Trello board. This planning flow is pretty standard and definitely not rocket science. Still, letting your work flow through the board like this will help you to keep the important things moving forward. Over time you will notice that the important things get done. The planning flow becomes very powerful when start sizing your tasks. Each card should have a rough estimate about how much it will take you to complete the card. I said how much it takes - not how long. It's a tiny difference in the estimation step. I like to use points in the scale of 1, 2, 3, 5, 8. Even though I did not think of it as hours it seems like I give a full-day task 8 points. Scrum for Trello allows you to add estimated effort and actual effort. Don't bother doing actual effort for this board. It does not add much value knowing how long it really took. The initial estimation is much more important, so I don't use actual at all. Now that planning is explained I want to get into the Doing part. Cards in the "Today" list have been ordered in the planning stage. The topmost card is the next card you should work on. Done: Simply move cards from "Doing" to "Done" when you have finished the work. This list gives you a sense of what you have achieved. The points help. Done This Week: All the cards that have been done this week so far. Every morning move all cards from "Done" to "Done This Week". Again, this gives you an idea of what you have achieved during the week. Done Week NN: At the end of each week move all the cards form "Done This Week" to a new list with the week number or date (e.g. "Done Week 42"). I keep around 4-8 previous weeks on the board. It helps me to see how I am doing (pun intended). This is how a day may look like. Daily: Every night, plan the next day and fill the Today list with up to 10 points. Weekly: Every weekend, plan the next week and fill "This Week" list with up to 40 points. Monthly: At the end of each month, plan the next month roughly. At this stage I don't have all cards estimated. If I had I would add up to 150 points. Quarterly: Every three month move the week lists into another board. I use a board that contains all week lists for the entire year. Where is my time actually going? To answer that question you should use the themed work week to label your cards, the Scrum for Trello Chrome extension to assign points to cards and the weekly lists described in this blog post. Am I doing enough strategy work? Am I doing too much finance work / should I hire a CFO? Where can I optimise, and what am I doing too much of? 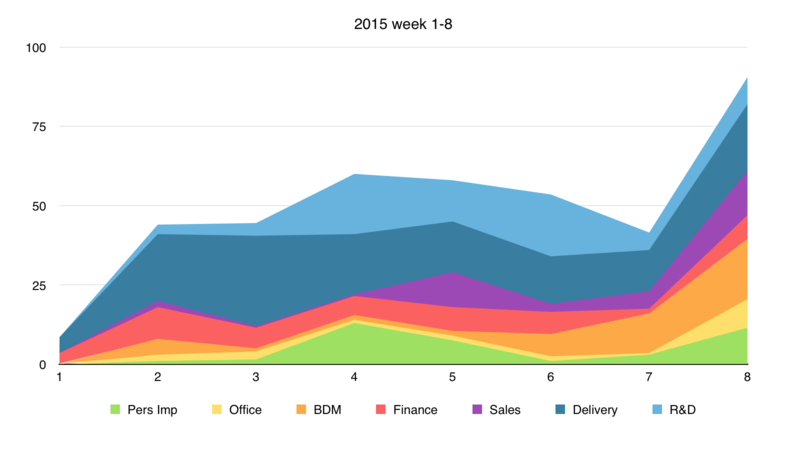 Here is some analytics of my work in the first 8 weeks of 2015. Efficient planning and execution requires a good system. 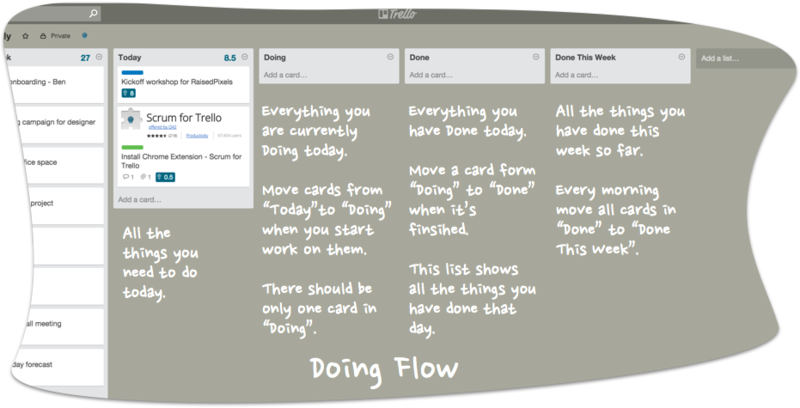 In this blog I have given an overview of how I use trello for my planning and doing flow, how to quantify my work and how to gain insight into where my effort goes. The system works for me and I hope it works for you too. Give it a try and let me if you have any suggestions for improvement.